The R&S®Scope Rider is a modern versatile handheld oscilloscope featuring lab oscilloscope performance in a portable format with the ruggedness of a battery operated handheld device. Its superior performance is the best in its class. Several applications can be addressed with this oscilloscope. It is extremely attractive for applications that require safe measurements, such as in power electronics. For example, analyzing modern electric drive systems requires measuring motor voltages and currents and evaluating the associated digital control signals. These voltages and currents are safety critical and require special measurement setup consideration. Operator safety is the key consideration for such measurements. The R&S®Scope Rider offers up to four isolated input channels with CAT IV 600 V rating that allow measurements on high-voltage electronics without compromising user safety. Digital control signals can be analyzed with the 8-bit wide logic interface that is isolated from the analog input channels. These measures ensure the safety of the instrument, but more attention must be paid to the safety of the operator. 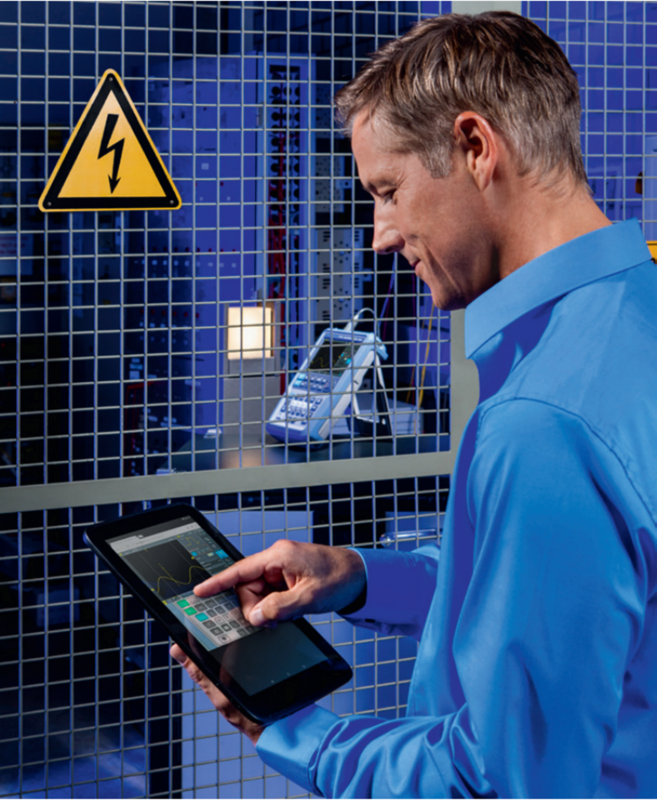 Operator safety can be accomplished by using the wireless LAN interface so that no cable jeopardizes the safety requirement. A laptop, tablet or smartphone can access the R&S®Scope Rider directly or via an access point. This allows the operator to remain at a safe distance during safety critical measurements and to operate the oscilloscope and react to unforeseen measurement events. To remotely start the measurement, the operator must properly connect the R&S®Scope Rider to the DUT before setting up the remote connection on the instrument. The operator now moves to a safe area and accesses the oscilloscope via remote terminal. 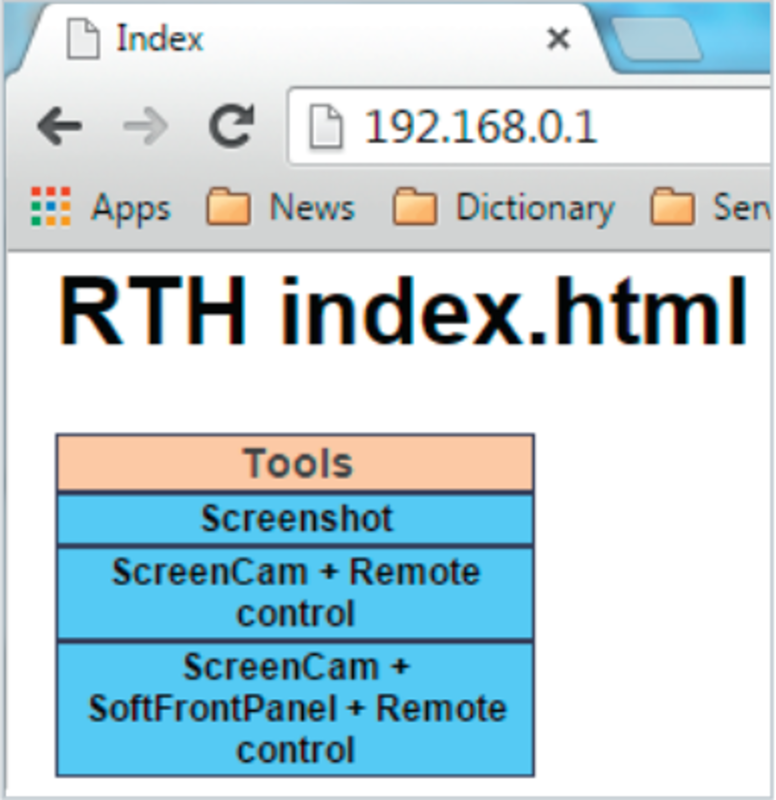 Opening a browser and entering the oscilloscope’s IP address (192.168.0.1) brings up a website with a tools menu. The operator can choose between a screenshot, a screen cam with remote control via pointer or a screen cam with soft front panel and remote control. The operator can adjust the terminal display size and resolution. 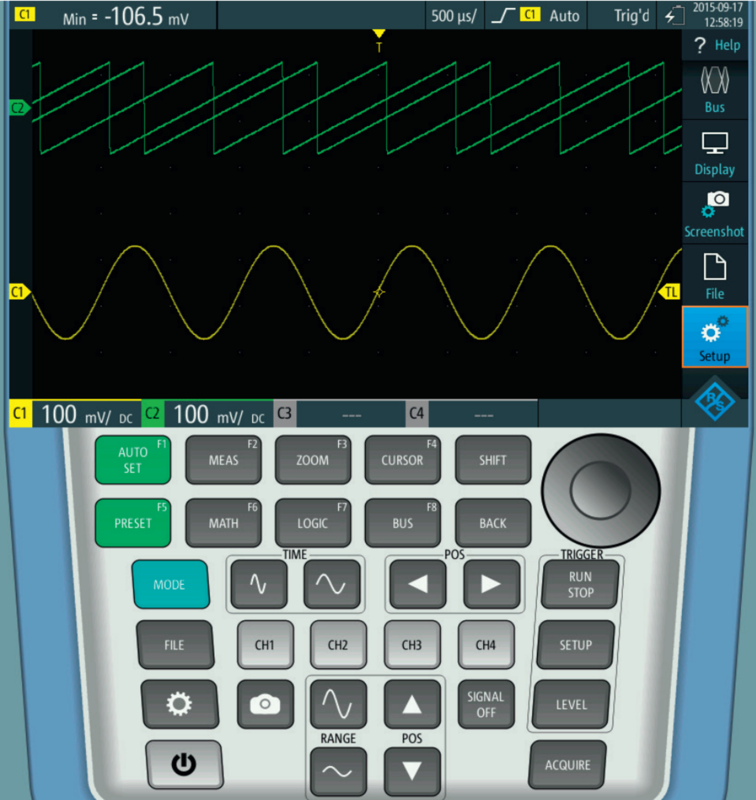 In the example shown here, the oscilloscope triggers and captures a sinusoidal signal on channel 1 and a ramp signal on channel 2, which is not synchronous to channel 1 and therefore moves across the screen. In the top left corner of the display, the result of an automated measurement (minimum) on channel 1 is shown. The excellent remote access performance (six frames per second) is noticed by watching the second channel as it is not synchronous to the trigger and appears as a moving waveform, as well as by the clock in the top right corner, which progresses without any gaps. Remember that this performance strongly depends on the quality of the wireless network. Proximity to the access point and interference from other nodes may degrade performance. The R&S®Scope Rider offers more options for remote access. Like a typical lab instrument, it is possible to access the instrument remotely via SCPI. This allows extensive programming of complex measurement scenarios that can be carried out in the field with a tablet, laptop or smartphone. 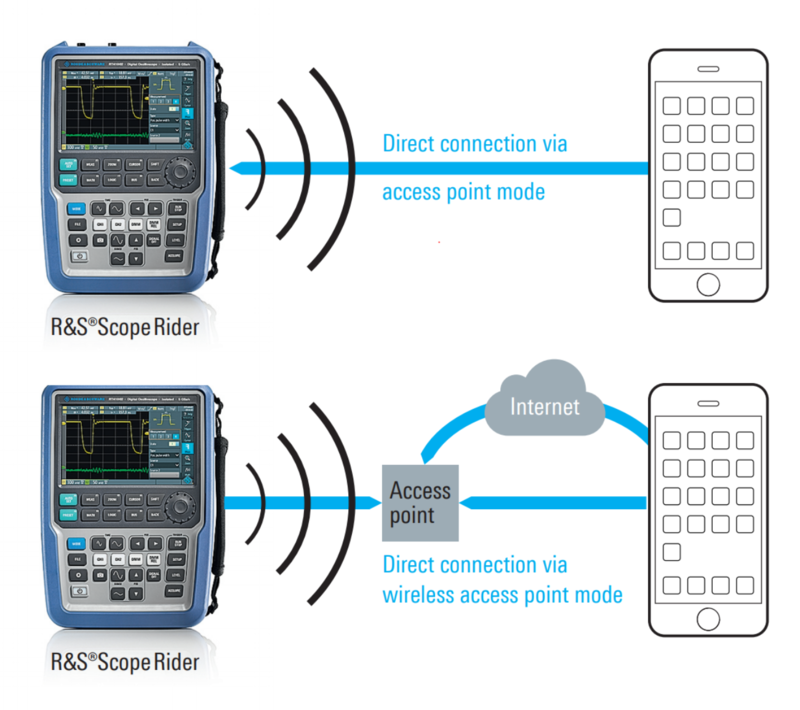 Remote access of the R&S®Scope Rider is not limited to the wireless interface. It can also be accessed via isolated USB and Ethernet ports. The R&S®Scope Rider is a handheld oscilloscope with a wireless interface for extensive, high-performance remote access. This is a unique and important feature, as are channel isolation and battery operation, when high isolation and safety critical measurements are required. Wireless access allows interactive control of live signals and fast execution of remote analysis.